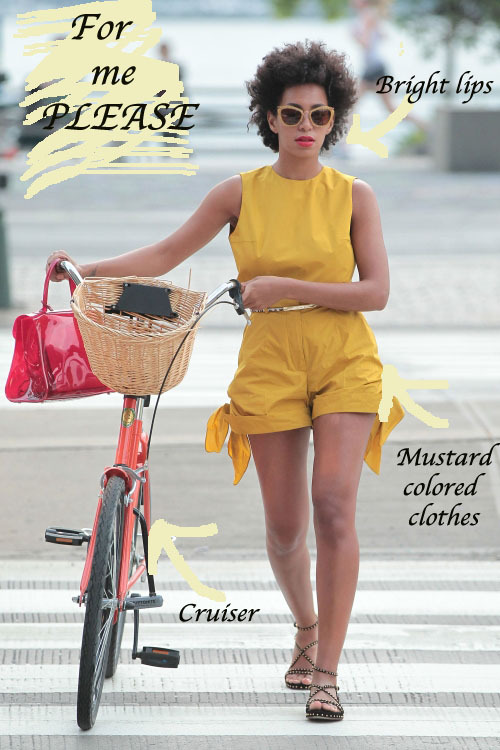 I stumbled upon this photo of Solange Knowles on Mother’s Day while browsing the internet yesterday during nap time. I instantly fell in love with all the elements of her Mother’s Day ensemble. Including the bike! Since I cut my hair three weeks ago, I have been dreaming of future bike riding days with River Mae. The thought of not having to worry about my perm sweating out is pretty inspiring. haha Coincidentally, on Mother’s Day my uncle (who saw my new short hairdo for the first time) said my outfit and haircut reminded him of Solange(!) Of course, I shamefully basked in his compliment. She even worked it when she had a TWA (teeny weeny afro) like me. You can see that here. Since I practically want everything in this picture, I thought I’d compile a pocket friendly wish list. *Note: the decision not to take classes this summer was a difficult one. I will go further in depth in another blog. Only happy thoughts! Wow, a beautiful boat neck tee at JCrew that’s on SALE! A cheaper, yet equally beautiful belt is here.